How to know to fix the error when the computer does not detect the printer, follow the steps. There are many reasons this error could happen, it will all depends on the circumstances it is, or what you have done those days with the printer. Next we will do a variety of recommendations so you can identify why the computer does not recognize the printer. First thing you must do when this error occurs is to check the USB cable, you can change this cable to another port in the printer, it is possible that no enough electricity is being transmitted, detecting the printer is necessary for the printer to work. To identify if the printer is installed you have to check the printer devices usually we can get this option in Control Panel of our computer, to reach the printers you have to click on Start then on the right side of the menu that is displayed find the option. How to get to your printer depends on the operative system you are using, what is truth for all operative systems is that at the top left side you will find the option to add a printer, click on it and search for your printer by using plug and play. 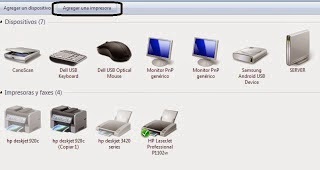 To do the last verification that the computer is not recognizing the printer click on add printer in the top left, then click on search printer with plug and play, in the bottom left side a message saying a new hardware has been detected must be display, when the printer is detected the drivers will be downloaded. Another way to solve this error is to uninstall the printer drivers completely, turn off the printer and turn it on again, download the drivers or if you have them in a CD you can do the installation that way, in case you do not have them in a CD you can download the HP as well as the Lexmark and Canon drivers from internet. You can also uninstall the printer drivers but with the printer being previously unplug from the computer, then you plug it again to your PC using the USB cable, and proceed to install the printer. It is possible that plugging another printer to the same computer can guide, if the computer detects the second printer, take the first one to another computer and check if it recognizes the printer, if it does not it means there are problems with the printer internal board.